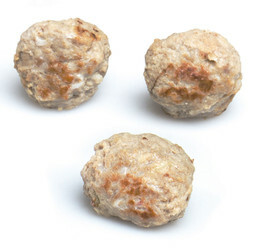 Classic Swedish meatballs 17g fried with high meat content. Preparation from frozen: Frying pan: On medium heat for 10-12 mi,nutes. Oven: 150°C for 20-25 minutes. Microwave 750 W: approx 2,minutes (1 serving 6-8 meatballs) Please note that this is appro,x. times, and can vary due to different capacity of the ovens.